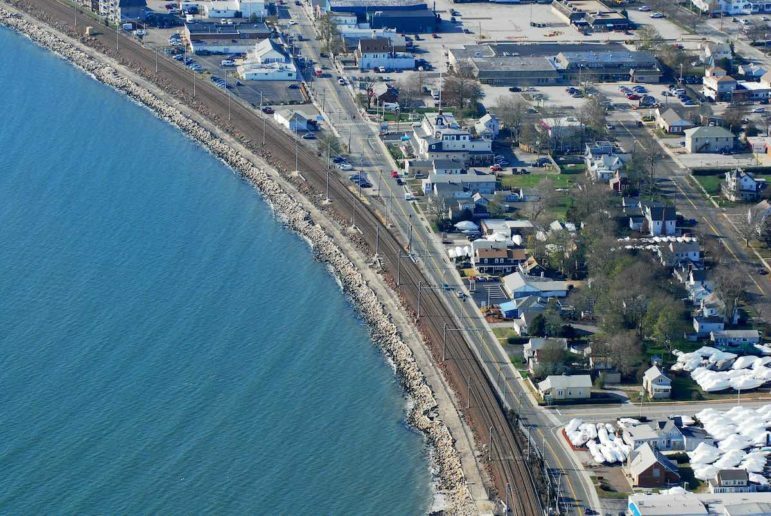 EAST LYME – In his seven years as East Lyme’s director of planning, Gary Goeschel has gotten used to seeing the railroad embankment along the Long Island Sound beach in the Niantic section of town under some type of construction. Second of two stories. Read part one here. Amtrak, which owns the line — part of the main Northeast Corridor route from Boston to Washington, D.C. — was already moving the track even closer to the water as part of the Niantic River bridge replacement when Tropical Storm Irene hit. The embankment damage it caused was repaired, the track re-aligned, and then storm Sandy hit. The newly placed riprap slid down the embankment again where it more-or-less is today, with a town project to fortify the embankment stalled. As climate change — including sea-level rise and more extreme storms — threatens Connecticut’s shoreline, more and more questions are being asked about the wisdom of keeping portions of the main rail line where it’s been for more than 100 years — right along the coast. The Amtrak/Shoreline East line in the Niantic section of East Lyme is wedged between the road and Long Island Sound. The Millstone Nuclear Power Station is visible in the background. Such questions have come up in Bridgeport and New Haven, where key stations and rail yards were built on fill in areas that were once Long Island Sound. (See part one of this series here.) But Connecticut’s most sustained stretch of vulnerable rail may be the Amtrak line from Niantic to the Rhode Island border. It meanders for miles and miles through salt marshes and the most vulnerable flood zones, as rated by Federal Emergency Management Agency, which doesn’t even factor in sea-level rise. No stranger to storm-induced destruction, the very same stretch of beach-side Niantic track was taken out by the infamous hurricane of 1938 along with swaths in New London, Stonington and Mystic. All were rebuilt more or less where they were. The New Haven to Rhode Island line, just over 68 miles long, is also used for Shoreline East commuter service between New Haven and New London, which Amtrak runs for the state and handled nearly 660,000 passengers last year. Today, using the Nature Conservancy Coastal Resilience Tool to model various storm and sea-level scenarios — including the 1938 hurricane, essentially a Category 3 storm — just about that entire Amtrak line is shown to be in some level of jeopardy. That in turn raises questions about state funds poured into building and upgrading the Shoreline East stations, several of which are in flood zones or not far from them. And it raises questions about the state’s exploration of potential new stations in some of the most problematic areas: Niantic and Mystic. 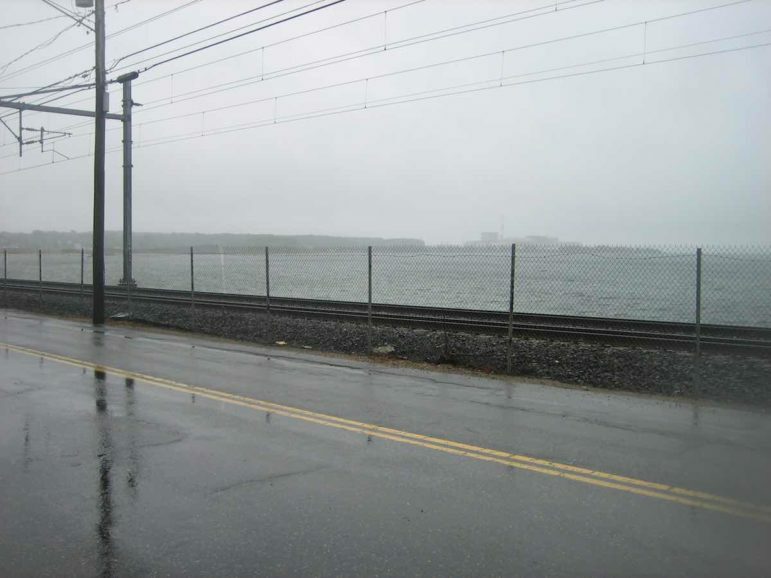 “You might want to take a close look as to where you put any station,” said Goeschel, who even suggested moving the Niantic stretch of rail line into a tunnel. The main area being explored for a station in Niantic is that same beach strip, still being repaired after Sandy. It’s not just the potential for water over the tracks in some of the lowest-lying areas, said Adam Whelchel, director of science for the Nature Conservancy’s Connecticut chapter, who served on the state’s Two Storms Panel and prepared portions of the most recent National Climate Assessment. It’s also water on roads under elevated tracks, something that many towns say happens more frequently, even during full moon high tides. 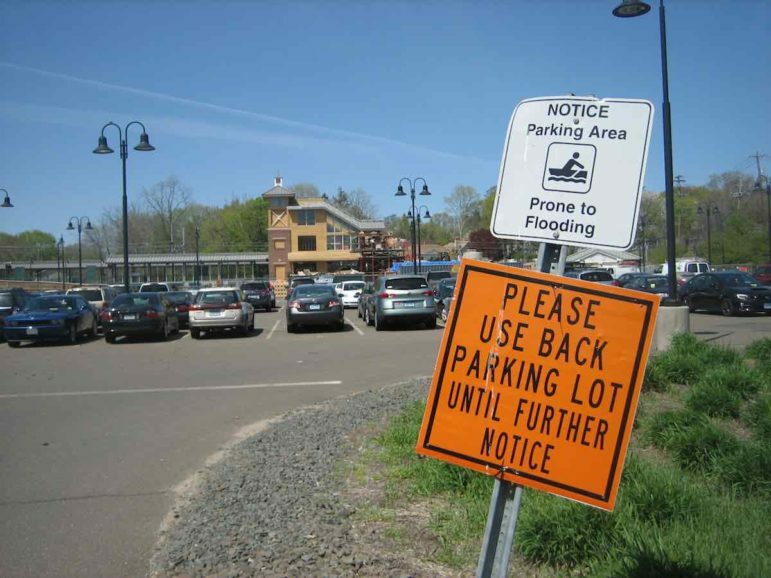 “Parking area prone to flooding,” reads the sign at the entrance to Branford’s 10-year-old train station. Situated slightly west of an older location adjacent to the mouth of the Branford River, it’s in a FEMA-designated food zone, a couple of feet below flood elevation, according to Janice Plaziak, the town engineer. The new Branford Station parking area is in the floodplain of the mouth of the Branford River and is known to flood. With the rail line snaking through salt marsh right next to the station and many more spots in the eastern part of town, and other, drier areas inaccessible or otherwise unsuitable, the present location was deemed just about the only place in town to put a station. Even so, there is an underpass just beyond it that floods regularly and swales are needed adjacent to the tracks to collect runoff. In the meantime, more than $30 million has been spent to upgrade the Branford, Clinton, Guilford, Westbrook, Old Saybrook and State Street, New Haven stations. Branford and Guilford are in flood zones, and Westbrook and Old Saybrook, are near them. 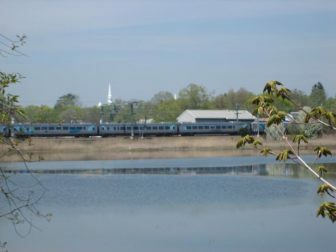 The Amtrak/Shoreline East line is slightly elevated above the mouth of the Branford River. 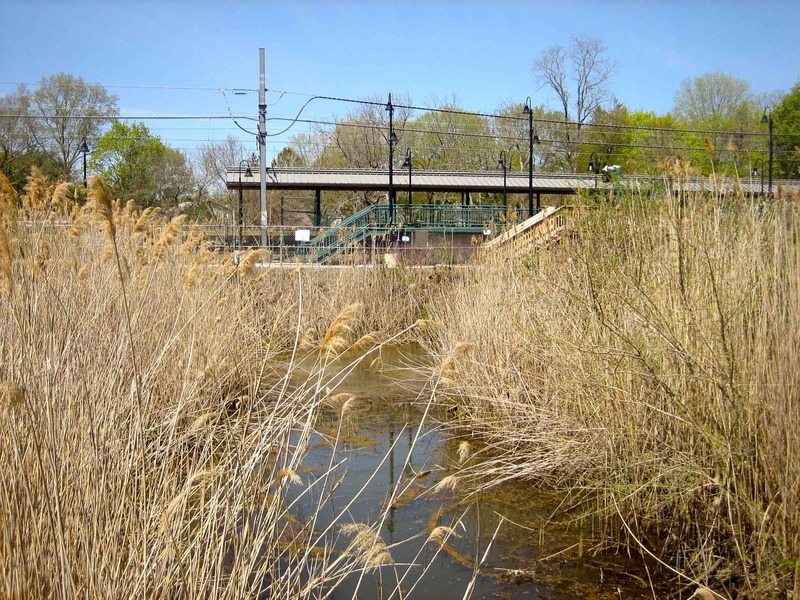 The tracks run through salt marsh and floodplains in other parts of town and nearly all of neighboring Guilford. “It’s really difficult to look 150 years out and say, ‘Well, we should put Branford station where it’s not going to serve my current needs because it might flood 100 years from now,’” said Bernick, who emphasized that many factors other than floodplains go into station planning. Do an assessment, but then what? 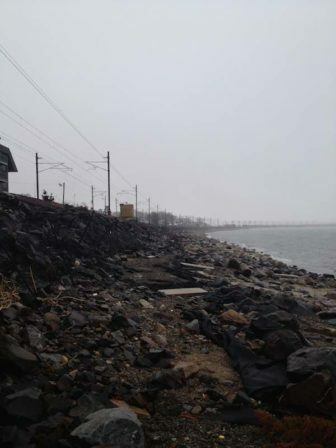 Storm Sandy washed out the boulders fortifying the embankment supporting the rail line in Niantic and separating it from Long Island Sound, on the right. In neighboring Stonington, with its own long stretches of low-lying track from the Mystic to the Pawcatuck Rivers, there is a new climate change task force coming up with recommendations to address climate change and sea-level rise generally. Mystic, and especially its historic section, is particularly susceptible to flooding, said Keith Brynes, who’s been town planner for 10 years. And Rob Klee, commissioner of energy and environmental protection, whose department is responsible for issuing waivers for stations built or upgraded in flood zones, hesitated before offering a “might be” when asked if there were places where the rail line needed to be moved or elevated. Klee said the emphasis right now is on finding creative ways to help lessen the impact of water coming both from Long Island Sound and inland, something he and others believe is equally, if not more, threatening. In addition to making tracks and stations inaccessible, water can also cause more erosion, undermining track embankments, bridges and other structures. Ideas for mitigating flooding include so-called green infrastructure, designed to soak up water and put it where it does less harm, and offshore solutions such as artificial reefs to diminish flow and intensity when the water does hit land. DEEP is working with the Connecticut Institute for Resilience and Climate Adaptation, CIRCA, the new climate center it runs jointly with the University of Connecticut. “It’s an important question about what should you do,” said James O’Donnell, CIRCA’s executive director. “We could engineer any kind of structure we want along the shoreline. It’s a matter of cost. There’s a financial cost, and then there’s an environmental cost,” he said, also citing the social cost when people use a rail line to get to work with no alternative. “It’s a critical element of a resilient community is to have a transportation network that is going to work when you need it. “It’s not automatic to me that you should just continue reinvesting in this,” he said of the rail line. Gary Yohe, a professor of economics and environmental studies at Wesleyan University, who serves on the Intergovernmental Panel on Climate Change and the National Climate Assessment, said he figures the current line probably can be protected in the short- to medium-term — 10 to 30 years. “But somebody has to sit down and redesign this, taking into account climate change and the manifestation of sea-level rise and storm surge coming into the Sound,” he said. It actually already has: Amtrak’s. Karen Gelman, an infrastructure planning manager for Amtrak’s Northeast Corridor infrastructure and investment development department is heading up a task force looking at climate change. Its preliminary report released last September singled out Connecticut to show the breadth of potential storm surge impacts on Amtrak’s line and stations. All of the state’s shoreline stations were within the actual storm surge from Sandy. It noted 113 segments vulnerable to storm surge throughout the Northeast Corridor and offered a series of predictions that showed Connecticut facing as much as five feet of sea-level rise by 2050, vastly increased storm surges by the end of the century, and more extreme heat days and precipitation, both of which can have effects on the resilience of the rail line. The Amtrak/Shoreline East line runs along the shoreline in the Niantic section of East Lyme, more or less where it’s been for more than a century and where it was when the Hurricane of 1938 damaged stretches of track. She said while prolonged heat can damage tracks and overhead electrical systems, sea-level rise and flooding remain the biggest concerns. “Sandy was clearly a wake-up call for us,” she said. And she added that flooding concerns are being considered in the planned high-speed rail line from New Haven through Hartford to Springfield. The lower portion of the line runs through floodplains along the Quinnipiac River, but the biggest flooding concerns are in the Newington and Hartford areas. The next phase for the Northeast Corridor, she said, is a climate change pilot project, and while Connecticut was one of the areas considered, Wilmington, Del., was chosen. Connecticut will have to wait. Which doesn’t have DOT’s Bernick worried that the rail corridor will wind up entrenched in a potentially vulnerable spot. And knowing what he knows now, if he had a do-over on building the rail line?